This page shows improvements to the language used to calculate measures in Analysis Services 2016 (Tabular Model). Many of these improvements will only be available to you if you use SSAS 2016 as a workspace server. 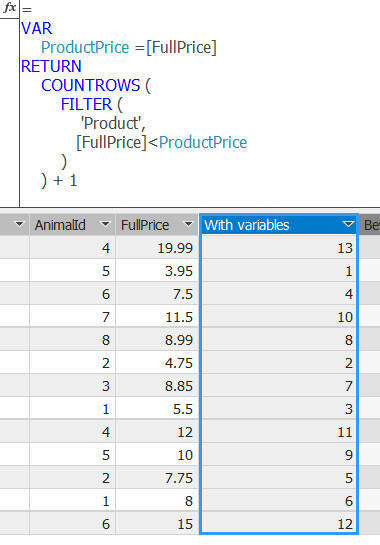 This function ranks products by their price, and is difficult to understand! 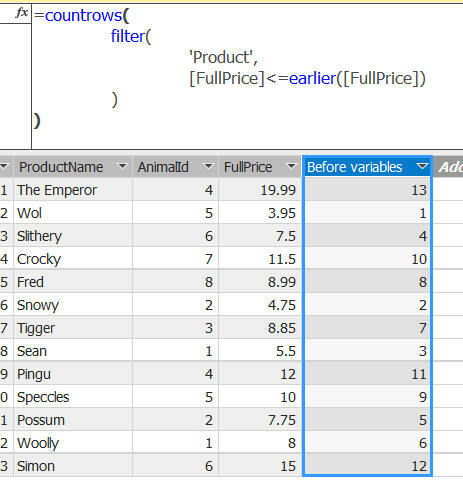 Create a variable to hold the full price of each product outside the filter context; you can then refer to this inside the DAX expression. Anything which means you don't have to use the EARLIER function has to be good news! We're comparing this period's sales with the same period for the previous year. This would give exactly the same results. DATEDIFF Calculate the number of time periods between two dates. CALENDAR Returns a single-column table of dates in any specified range. PRODUCT Returns the product of a set of numbers in a column. GEOMEAN Returns the geometric mean of the numbers in a column. PERCENTILE.EXC Returns a given percentile of a set of data. XIRR / XNPV Returns the internal rate of return or net present value of a set of data. MEDIAN Returns the median of the numbers in a column.